Plasma membrane is a dynamic, fluid structure and forms the external boundary of cells. It acts as a selectively permeable membrane and regulates the molecular traffic across the boundary. The plasma membrane exhibits selective permeability; that is, it allows some solutes to cross it more easily than others. Different models were proposed to explain the structure and composition of plasma membrane. In 1972, Jonathan Singer and Garth Nicolson proposed fluid mosaic model, which is now the most accepted model. In this model, membranes are viewed as quasi-fluid structures in which proteins are inserted into lipid bilayers. All plasma membranes, regardless of source, contain protein as well as lipids. The ratio of protein to lipid varies enormously depends on cell types. For example, the plasma membrane of human RBC contains 43% lipid and 49% protein by weight whereas plasma membrane of mouse liver cells contains 54% lipid and 46% protein by weight. 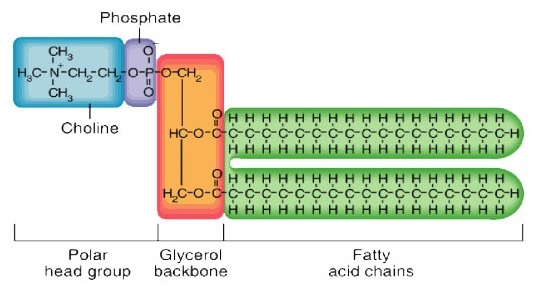 Carbohydrates are also present in plasma membrane and comprise only 5-10% of membrane mass. Phospholipids: Phospholipids are made of four components: an alcohol, fatty acids, phosphate, and an alcohol attached to the phosphate. The fatty acid components are hydrophobic, whereas the remainder of the molecule has hydrophilic. There are two types of phospholipids: glycophospholipids and sphingophospholipids. 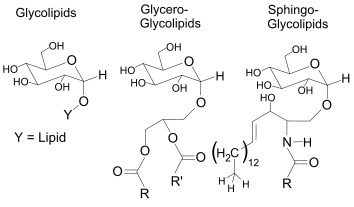 Glycolipids: Glycolipids contain carbohydrate covalently attached to the lipid. These can derive from either glycerol or sphingosine. The simplest glycolipid, called a cerebroside, contains a single sugar residue, either glucose or galactose. Sterols: The basic structure of sterol is a steroid nucleus, consisting of four fused rings, three with six carbons and one with five. It is planar, and relatively a rigid structure. Cholesterol is the major sterol present in the plasma membrane of animal cells. The fluidity of the lipid bilayer, the optimal value of which is a prerequisite for normal cell growth and function, depends on lipid composition and temperature. In general, an increase in the temperature tends to elevate membrane fluidity. Lowering of temperature causes a freely-flowing, low viscous, fluid like membrane structure to a more rigid, gel like organization. Many of the proteins associated with membrane can be released from the membrane by relatively gentle extraction procedures, such as exposures to solutions of very high or low ionic strength. These procedures interfere with weak non covalent interactions between protein-protein or protein-membrane lipid, but leave the lipid bilayer intact; these proteins are called peripheral protein (or extrinsic proteins). Proteins that are held in the lipid bilayer very tightly and cannot be released by relatively gentle extraction procedures are called integral proteins (intrinsic proteins). Integral proteins are mostly transmembrane proteins. Transmembrane proteins may be single pass or multipass. Glycophorin is a major single pass transmembrane protein of RBC. Membrane proteins can also be classified on the basis of functions like catalytic proteins, structural proteins, and transport proteins. Transport proteins are responsible for selective transport of molecules, may be carrier or channel proteins. Carrier proteins can be uniporters or co-transporters. Carrier mediated transport may be active or passive. Channel proteins transport solutes down their concentration gradients. It is always passive and transport through channel proteins occurs at a much faster rate. The bacterial plasma membrane is a unit membrane bound composed primarily of proteins and phospholipid. Its structural and chemical features are similar to eukaryotic plasma membrane. One major difference in chemical composition is that eukaryotes have sterols in their membranes. Sterols are absent in plasma membranes of all prokaryotes except for mycoplasma. It is selectively permeable, that is, it regulates the entry of certain selective solutes. It separates the cytoplasm and cell organelles from the extra cellular matrix. It aids the attachment of cytoskeleton and cell wall for different organisms. It participates in the process of cellular transport as it possesses extrinsic and intrinsic proteins. Since the membrane is composed of proteins and lipids, the flexibility of membrane is maintained by lipids while proteins regulate the chemical environment of cell. They help in the transport of various import ions or molecules. It acts as a physical barrier.